The Fourth » Cyril’s just no fun. And he doesn’t care about Derk either?! I hope I didn’t totally fail at communicating the cross-section in the last panel. It was tricky. Be sure to send us more questions for Wednesday’s update! He just doesn’t want Lorelei to get hurt. Because she’s a cute little kid. Really Cyril? You just had an awesome moment a few pages ago, and now you do this. I take back whatever I said about you, mister! …hm. That Floyd question stays, without a doubt; I have to know. And…vague question; what does everyone do in their spare time? If they even have any? Maybe he can just chip away at the wall by whacking it with his medallion. That’s how he solves problems. But she had a face of confidence don’t mess with her… she also has red hair so she is already feisty enough. And she is short with something to prove. And if she was Irish then I would just stop reading the comic cause she would come and try to kill me…. But if Cyril wasn’t there and Lorelei just acted shocked, they might just get away with it. Man Cyril, you just can’t do crazy logic, gotta go with safe logic. Lorelei would have gotten away with it too, if it wasn’t for you meddling bard! Maybe it was better she didn’t use that cannon… But I was still excited for it. She’ll just have to come up with something even more unexpected and violent. And she just might?! Dang it, Cyril! 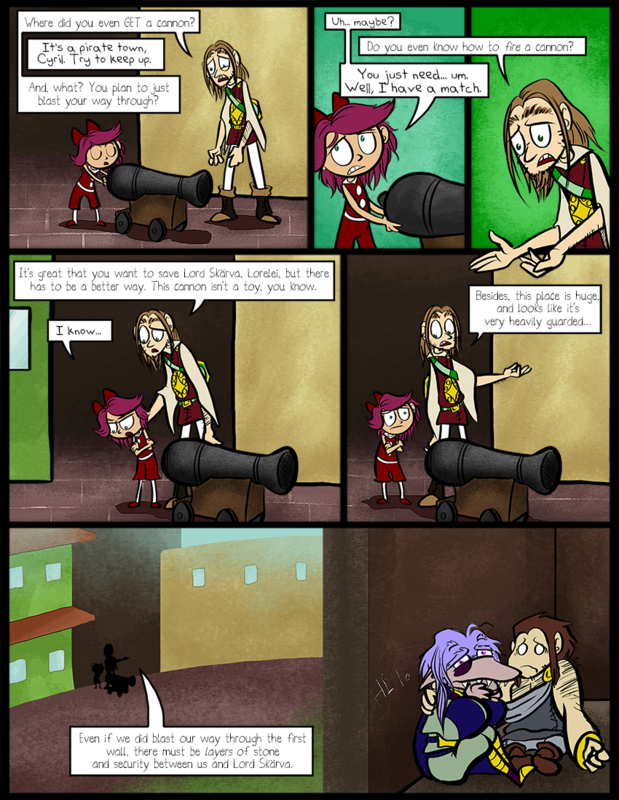 Bards aren’t supposed to talk people down! They’re supposed to sing so that the other party members will do their absolute best so you stop singing as soon as possible! Aww the looks on their faces in that last panel make me want to cry… Also, you did good communicating the cross-section. That’s what I thought it was when I saw it.